Saudi Arabia halted new trade and investment dealings with Canada and suspended diplomatic ties in a dramatic escalation of a dispute over the kingdom’s arrest of a women’s rights activist. The kingdom recalled its ambassador to Ottawa and ordered the Canadian envoy to Riyadh to leave within 24 hours, according to a foreign ministry statement cited by the Saudi Press Agency. Canada is “seeking greater clarity” about the matter, a spokeswoman for Foreign Minister Chrystia Freeland said. The Saudi foreign ministry cited remarks last week by Freeland and the Canadian embassy in Riyadh, criticizing Saudi Arabia’s arrests of women’s rights activists including Samar Badawi. She is a Canadian citizen whose brother Raif Badawi, a blogger who was critical of the Saudi government, was already in jail in the kingdom. “The kingdom views the Canadian position as an affront to the kingdom that requires a sharp response to prevent any party from attempting to meddle with Saudi sovereignty,” according to the statement. Just two months ago, Saudi women were given the right to drive a car, yet several of the country’s most prominent women’s rights activists -- including some who fought for years to drive -- were arrested earlier this year on national security grounds. Saudi investments in Canada include G3 Global Holdings Ltd., a joint venture between Bunge Ltd. and Saudi Agricultural & Livestock Investment Co., which purchased the former Canadian Wheat Board in 2015. Saudi Arabia has invested about $6 billion in Canadian businesses since 2006, data compiled by Bloomberg show. Tanks, armored vehicles and parts and motor vehicles accounted for about 45 percent of Canada’s 2016 exports to the kingdom, while crude oil and copper ores comprised about 98 percent of imports, according to a government report. Saudi Arabia supplies oil to the Irving refinery in Saint John, New Brunswick. Canada are a net oil exporter and don't really care about Saudi Arabia. They can do whatever they want: their loss. Saudi's are idiots, they've got so used to leading with an iron rod, anyone showing any sort of dissent is treated like a mortal enemy of the state. Raif Badawi is an idiot, I've read his blog and his 'free thinking' would make the likes of Gul Bukhari etc seem like the second coming of Voltaire. Yet they've given him such prominence those supporting his cause will be left smacking their forehead when he's eventually released and his views match the most rabic right wing in American politics. Agreed. The Badawi guy and his wife are worse than right wing nuts in their views on Islam. Saudi should have just ignored them instead of making martyrs out of their third rate ideas. I wish Canada hadn't given asylum to his wife as she's rabidly anti Muslim, even attacking Pakistan needlessly and supporting India (likely got paid for it). This could be good news for oil and gas in Canada as now eastern Canada would be happy to buy Canadian oil instead of foreign. Somebody needs to get Al-Hejaz out of the hands of Daaku saud family. Ok this is bonkers. 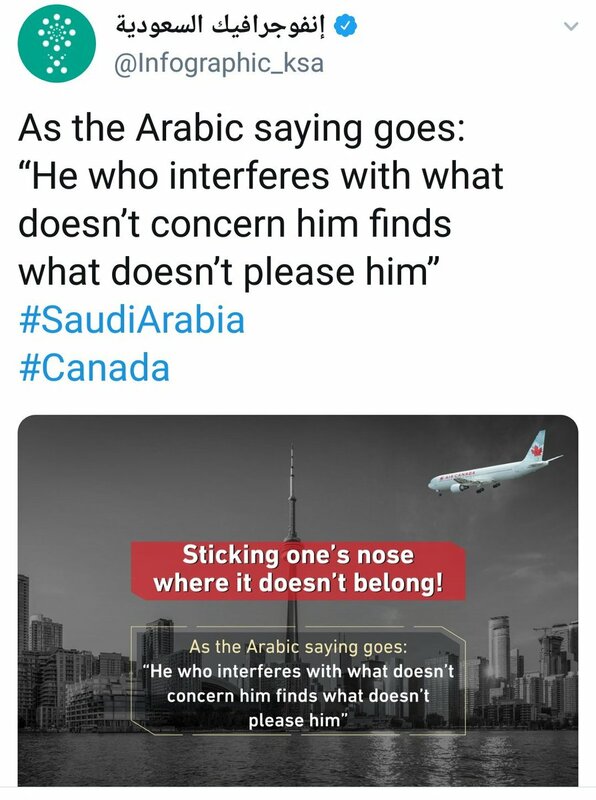 Saudi foreign ministry tweets: “Any other attempt to interfere with our internal affairs from #Canada, means that we are allowed to interfere in #Canada's internal affairs”. Hmm, what does that mean? Don't tell me this account has anything to do with the Govt of Saudi since that would be hilarious on so many grounds. Dunno if it is, but bad enough that it's verified. They redid it, without the plane. My word this has got to be up there with the most "multi-meaning" tweets ever. Earlier we posted an image which was inappropriate, which is why we deleted the post immediately. The aircraft was intended to symbolize the return of the Ambassador, we realize this was not clear and any other meaning was unintentional. We apologize to anyone who was offended. Ok, at first I thought why is Canada talking about Saudis, then i read that the bloggers sister is a Canadian citizen as well, so it makes sense why Canada would issue a statement. KSA is getting more and more belligerent. They know they have uncle sam's backing so it goes around doing what it wants similar to Israel. Uncle Sam for all of its rhetoric of "freedom, democracy, human rights" is backing an oppressive Saudi regime, while at the same time condemning Iran for human rights violations. Had a heated debate with my dad about this, who was doing exactly what you say in the second line. It's sad. Then he labels me as a supporter of kafirs. What is the point of all that prayer and Quran reading when you yourself decide to support evil rotten to its core. Canada should mind its own business, lets talk about thosuands of missing indigenous girls. Uncle Sam should mind its own business first. Always going around trying to give "freedom" to people. Hows your freedom going for Syrians, Libyans, Iraqis, Afghans these days? Do I look like a supporter of uncle sam? Canada is also part of NATO and is equally complicit. If a Canadian citizen gets arrested for a dubious reason, its their business. In apparent escalation of a rift between Saudi Arabia and Canada on Monday evening, Riyadh suspended scholarships for Saudi students in Canada and said it would relocate thousands of students studying there to other countries, state media reported, citing an Education Ministry official. The move followed the Kingdom's announcement yesterday that it was expelling the Canadian ambassador and had recalled its envoy while freezing all new trade, in protest at Ottawa's vigorous calls for the release of jailed activists. KSA gave the Canadian ambassador 24 hours to leave the country, in an abrupt rupture of relations over what it slammed as “interference” in its internal affairs. Canadian Foreign Minister Chrystia Freeland was quoted by Reuters as saying to reporters on Monday that "it would be a shame for those students if they are deprived of the opportunity to study here." According to the Toronto Star, there are about 16,000 Saudi students studying in Canada. Freeland late on Monday also tweeted an official statement saying that Canada would "continue to advocate for human rights and for the brave women and men who push for these fundamental rights around the world." "Canada will always stand up for the protection of human rights, including women’s rights and freedom of expression around the world. We will never hesitate to promote these values and we believe that this dialogue is critical to international diplomacy," the press release read. "We are deeply concerned that Saudi Arabia has expelled Canada’s ambassador in response to Canadian statements in defence of human rights activists detained in the kingdom. The Embassy of Canada to Saudi Arabia, in Riyadh, continues its regular operations, including consular services," the statement added. Well Canada should not have poked its nose in Saudi affairs. Yes Saudis have a poor human rights record etc etc etc but at the end of the day they are a sovereign nation handling their internal affairs. You do know that Palestine and Saudi are two very different countries, right? Saudi have gone ahead and suspended all Saudia flights to Toronto. Saudi are home to trillion dollar Saudi Aramco, they're not losing anything lol. Damn, well, that escalated fast. Is it really that big of a deal? I mean they could have worked it out instead of throwing such a big tantrum! Trillion dollar Aramco where they do diddly squat. Without expertise from the West and labour from the East, not a wheel will turn in Saudi Arabia. Oh, and Aramco = Arabian-American Oil Company. I can assure you nothing in Canada, oil company or otherwise, is named after Saudi Arabia. So what? You come off as a white supremacist who thinks only westerners have the intelligence and skills to become successful, the self hate is real. Canada's entire economy was propped up and is supported by the American economy. I'm pretty sure Saudi has investments in Canada like in other countries, they have a veru large sovereign wealth fund. Lol what? Canada is where USA exports a huge amount to, so many services and blue collar jobs depend on it, Canada on the other hand has so many resources per person it's not even funny, they would easily survive just by dealing with all other countries. Canada was actually doing pretty good before WALL MART and Target showed up. Even the Desi Americans are so arrogant,not even funny. Oh, so me stating some home truths about beloved Saudi Aramco makes me a self hater!? America's presence in Canada is much more than judt "WALL MART and Target", over 80% of Canada's economy is tied to the United States. If Canada blocks our exports we can annex them and they can do nothing about it. Canadas oil industry was developed by America, read up about Americans working in Alberta. You are saying if Canada doesn't allow export, America would annex Canada? Lol. Used to have such frequent debates with my folks too before but then decided it is is pointless as they are either too old minded, stubborn/proud or set in their ways to change now. Better to just avoid getting into these discussions. Fallacy but I understand why you came up with this which has no merit in real world. Canada's economy is heavily depended on US, and off course Canada will survive, as if they will have any other option but to survive. It has nothing to do with ignorance. On topic, MBS and Saudi are shooting themselves on a foot, Canada will never compromise on this issue and the world that matters, at least on the surface, will be on Canadian side. Why do canadian citizens have to go to Saudi and break their laws? Laws may be archaic, medieval, anti human rights but its their law. Let saudis protest if they dont like these laws. Why Canada? Seriously, please sign up for Macro 101 if still in school. There's an obvious reason why IMF classifies Saudi Arabia as a developing economy, while Canada as an advanced economy. MBS be like ‘yeh bik gai e Canadian gormint, ab in may kuch nai raha’. The Badawis were born and raised in Saudi Arabia. MBS got too much power way too soon. Another young world leader i can imagine is Austrian vice Chancellor and he is also not a believer in moderation. wow, this escalated and how. If they are saudi citizens then Canada should not interfere. If they are saudi born canadian citizens then canada has to stop its citizens from going to another country and breaking their laws. And then Canadian Ambassador issues a statement. RIYADH: Saudi Arabia said on Wednesday there was no room for mediation in the kingdom’s deepening diplomatic dispute with Canada, and that Ottawa knew what it needed to do to “fix its big mistake”. In an indication that the quarrel may worsen, Mr Jubeir said that the kingdom was still “considering additional measures” against Canada, but did not elaborate. Responding to a question about the reason for the activists’ arrests, Mr Jubeir said that charges against them would be made public once their cases reached the courts, repeating earlier allegations that they had been in touch with foreign entities. “The matter is not about human rights; it is a matter of national security,” he said. Reports say Canada plans to seek help from the United Arab Emirates and Britain to defuse the row. The Financial Times reported the Saudi central bank and state pension funds had instructed their overseas asset managers to dispose of their Canadian equities, bonds and cash holdings “no matter the cost”, citing unidentified sources. A Canadian departmental spokesperson said Global Affairs Canada continues to seek clarity from the Saudi Arabian government on various issues. A source at a Saudi bank said it was contacted by the central bank on Wednesday afternoon asking for information about all their Canadian exposure investments in Canada and foreign exchange positions. ISLAMABAD: In what looked to be a word of caution for the non-career politically appointed ambassadors serving in different capitals across the world, the Foreign Office on Thursday suggested that many of them would soon have to pack their bags. “According to their contract, non-career ambassadors are deemed to have resigned, unless the new government decides otherwise,” Foreign Office Spokesman Dr Muhammad Faisal said in response to a question about the ambassador to the United States, Ali Jehangir Siddiqui. The future of politically appointed ambassadors has been hotly debated since the Pakistan Muslim League-Nawaz government completed its tenure on May 31. The PML-N had during its tenure appointed 21 ambassadors on political grounds, some of whom have already left on completion of their contract. The remaining ones, too, as per diplomatic norm, are expected to stand down with the change in government. The two interesting cases of political appointees are that of Mr Siddiqui, who presented his credentials to President Trump three weeks after the PML-N government left office, and High Commissioner to Canada Tariq Azim, who was granted a two-year extension in the service contract shortly before the PML-N government’s tenure ended. The Pakistan Tehreek-i-Insaf (PTI) had taken a strong position against the appointment of Mr Siddiqui and it may be difficult for the party to step back unless the other powerful stakeholders in the Foreign Policy arena intervene in his favour, about which many are already speculating. Another high-profile political appointee, Permanent Representative at the UN in New York Dr Maleeha Lodhi, who met PTI chairman Imran Khan a few days ago for what the FO described as a private meeting, is being tipped to be retained in her position. Pakistan has sided with Saudi Arabia in its latest diplomatic spat with Canada. “Pakistan stands by the Kingdom of Saudi Arabia in protecting its sovereignty as a matter of principle and based on the historic and brotherly relations between our two countries,” the spokesman said. The spat between Saudi Arabia and Canada started after Canada’s Foreign Minister Chrystia Freeland tweeted to demand release of women’s rights activist Samar Badawi. Later, the Canadian government called for immediate release of jailed activists. The Saudi government took strong exception to the Canadian criticism of the treatment of rights activists in the Kingdom and expelled Canada’s ambassador besides recalling its own ambassador from Ottawa. Besides, Pakistan’s solidarity with a Muslim country and its position on sovereignty of states and the principle of non-interference in the internal affairs of other states, the stance taken by the FO is driven by its uneasy relationship with Canada, a diplomatic source revealed. The Pakistan government is unhappy with Canada over its discriminatory visa policy towards Pakistanis, negative travel advisory and Canadian high commissioner in Islamabad’s attitude towards the host government. Responding to a question about re-imposition of US sanctions on Iran, the spokesman took a cautious position. “We are examining the implications of the US re-imposition of sanctions on Iran. However, Pakistan, being a sovereign state, reserves the right to pursue legitimate economic and commercial interests while respecting the international legal regime,” the spokesman said. “They (Indian leaders) have been trying to do it for the last 70 years. This is a direct violation of the UNSC Resolutions. We have consistently been raising this issue on all international forums and shall continue to do so,” Dr Faisal said. He said that India could not crush the legitimate, indigenous Kashmiri struggle by such nefarious, underhanded means. “All such Indian efforts have failed in the past and they will continue to fail in future also,” he added. “The only solution to the Jammu and Kashmir dispute is through the realisation of the right to self-determination of the people of Kashmir through an impartial UN-administered plebiscite in accordance with UNSC Resolutions,” the spokesman said. Only ties people want to maintain with Saudi is for religious purposes, oil and money. Otherwise why would anyone want to have relations with this dimwitted country? Plenty of “their country / their laws” and “every nation for itself” type comments being rolled out, which they always are for Saudi Arabia more than most. These are such enslaved cop-out responses, clearly designed.to avoid addressing the points that have been raised - as if people aren’t even entitled to hold an opinion on this.